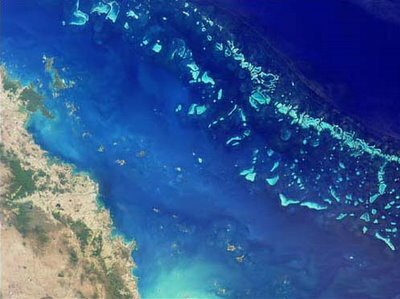 Strange that we both used this Picture for a post last week… somehow the world is kinda small afterall, even with super reefs. I’m liking the blog by the way… it’s rapidly become part of my daily sites-I-need-to-check! Will, thanks – hadn’t seen that. How’s the desert? You a musician? I remember two things: When I was on a camping trip in the bush of Northern Queensland, our guide showed us a fossilized reef along the Bundock River. Apparently these things exist in a number of places. Also, there’s an installation on the Adriatic Coast in Croatia called the Sea Organ that makes sounds based on the movement of the water. There is a similar device in San Francisco, as well.